This section explains forfeiture of service and how you can be protected from a complete loss of Plan benefits. It also explains special rules that can protect your benefits while you are away from covered employment. Different forfeiture rules were in effect before 1976. Click here for more information. To avoid an interruption of service, you need to complete at least 250 hours of service in a calendar year. If you complete less than 250 hours of service in a calendar year, that year counts as an interruption of service. Remember, your hours of service include your covered hours and certain other types, such as hours of noncovered employment and disability absence hours (explained next). 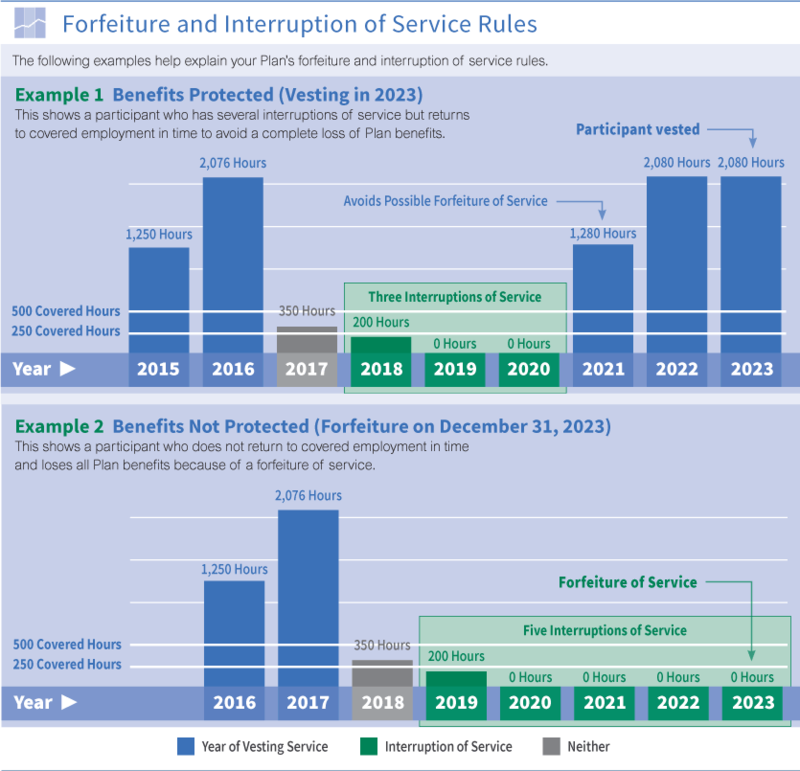 Click here for two examples that help explain your Plan’s forfeiture and interruption of service rules. The first shows a participant who has several interruptions of service but returns to covered employment in time to avoid a complete loss of Plan benefits. The second shows a participant who does not return to covered employment in time and loses all Plan benefits because of a forfeiture of service. Even if you are not working in covered employment or go on a reduced work schedule, your Plan counts certain time away from covered employment as hours of service. Other hours of service while on maternity or paternity leave can help you avoid an interruption of service but do not count as hours of service for vesting. All of these hours of service are explained next. The Plan offers certain protections from loss of benefits for eligible participants whose Teamster careers are interrupted due to disabilities that may or may not be permanent. If you are totally disabled from working in your Teamster job in any month, you can qualify for special hours of service to bring your total hours for that month up to 50. Hours of service you earn due to a total disability count toward vesting and can help protect you from a complete loss of Plan benefits. They do not count for any other purpose. If your total disability lasts more than 36 months, you can continue to qualify for disability absence hours by documenting your total disability with a Social Security Disability Award Certificate showing your eligibility for a disability benefit. If this certificate is not available, the disability must be documented with medical evidence verifying that you cannot engage in any substantial gainful activity because of a physical or mental disability. If it turns out you need disability absence protection, you can apply for it at any time up to your retirement. Because you must provide evidence of your disability, you are encouraged to contact your Administrative Office as soon as possible after your period of disability ends. Medical records and statements from your physicians are easier to obtain at that time rather than if you wait until retirement. Your Administrative Office provides you with a form on which you can explain why you were not able to work in your usual Teamster occupation. You also receive an explanation of the types of proof of disability you may provide to establish your right to this protection. Note: Special procedures apply to handling your application for this disability absence protection. Hours of service for non-covered employment can help protect you from a complete loss of Plan benefits. You may be eligible for hours of non-covered employment if you are working for a covered employer but your job is not covered by the Plan. Contact your Administrative Office if you think you may be eligible for non-covered employment. If your covered employment is interrupted by a call to active duty in the U.S. Armed Forces and you meet certain other requirements, you may qualify to have your period of military service count as covered employment. If you qualify, your time in the military counts as covered employment from the date you leave covered employment with your employer through the date you return to covered employment with the same employer. You are credited with covered hours, contributions and vesting service for your period of military service just as if you remained actively working for your same covered employer. This pension credit applies when determining all benefits available under the Plan including survivor benefits. You must receive an honorable discharge or its equivalent under U.S. military law. Not all types of military service count under these rules. If you think your military service may qualify, contact your Administrative Office as soon as possible. You need to provide a copy of your DD-214 for verification. If you qualify to have your period of military service counted as covered employment, your Administrative Office credits you with covered hours using the formula explained below (unless your employer and local union have agreed on a different formula that credits you with a greater number of covered hours). The formula looks to the average number of covered hours per month you earned with your covered employer in the 12 months just before you left covered employment with that employer to enter military service. You are then credited with the same number of covered hours per month during the period starting with the date you left covered employment with that employer to enter military service until the date you returned to covered employment with that same employer after leaving military service. If you die or become totally and permanently disabled while in military service, the requirement that you return to covered employment is waived. If you work in an industry (such as the construction or convention trades) where you are required to obtain work through a hiring hall, the hiring hall is considered to be your employer under these rules. If you have questions about your pension rights under federal veterans laws, call your Administrative Office. You can also find information on the internet by searching USERRA the Law. If you leave covered employment and find another Teamster job not covered by this Plan, your work may count toward vesting and help protect you from a complete loss of Plan benefits. You must return to covered employment and again become an active Plan participant within two years after you leave your non-covered Teamster job. Hours of service you earn under this rule count toward vesting and help protect you from a complete loss of Plan benefits. They do not count for any other purpose. Click here for an explanation of when you are considered an active participant. If you cannot work at least 250 covered hours in a calendar year because you are on a maternity or paternity leave from a covered employer, you may qualify for protection from an interruption of service. Caring for the child for the period immediately following the birth or placement. To receive credit for your leave, you must send written proof that your leave was for one of the reasons listed above to your Administrative Office within one year after your leave begins. If your leave qualifies, you are credited with eight hours of service for each normal work day during your leave, up to a maximum of 250 hours of service for any one pregnancy or adoption placement. These hours of service only count toward preventing an interruption of service in the year your leave begins or in the following year. They do not count as hours of service for vesting or any other purpose. If your participant status changes in any way not explained in this section—if, for example, you transfer to a non-covered job or the organization you work for is sold or bankrupt—your Plan benefits may be affected. If you are not vested, you can have a complete loss of Plan benefits. Even if you are vested, these types of changes can result in a loss of recent coverage or PEER eligibility. You leave your employer but do not go to work in covered employment for another employer. You move from a covered job to a non-covered job with the same employer. Your employer goes out of business or sells out to another company that does not assume the obligation to continue contributing under your collective bargaining agreement. Your employer files for bankruptcy. Your employer no longer has a collective bargaining agreement with your local union. Your employer and your local union agree to terminate participation in the Plan. Your local union stops being your collective bargaining representative. If you lose Plan coverage for any reason, contact your Administrative Office to verify your current vesting status and the impact that ending your Plan coverage may have on your eligibility to receive benefits. If you had a break in service under the Plan before 1976 and were not yet eligible for retirement, the rules regarding loss of benefits that were in effect at that time apply to your service before the break. Before 1969, you broke your service if you had a total of less than 600 covered hours in two consecutive calendar years. If you had at least 7,500 covered hours, a break in service occurred if you earned less than 600 covered hours in three consecutive calendar years. If you had less than 7,500 covered hours, a break in service occurred if you earned less than 600 covered hours in two consecutive calendar years. If you had a break in service before 1976, you cannot get credit for any coverage, contributions or past employment under the Plan before your break in service (unless you qualify to have forfeited service restored under the Plan’s pre-1976 restored covered hours rule as explained next). Long-time Plan participants who lost contributory service credit because of a two-year or three-year break in service before 1976 may qualify to have their contributory service credit restored so that it can be counted when calculating Plan benefits. You did not retire before 1999. Your restored covered hours increase your future service credits under the Plan’s five-year average formula used to calculate your benefits for covered employment before 1987. 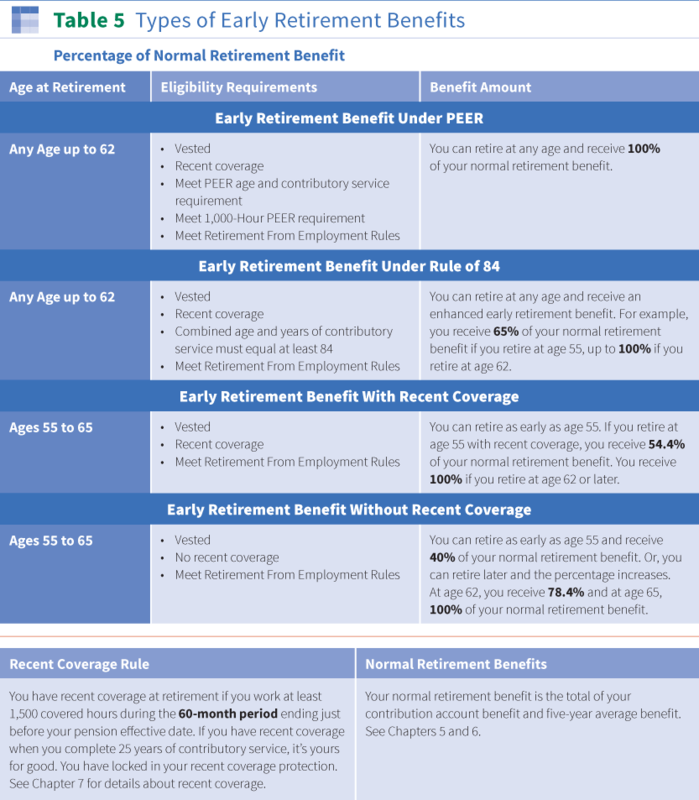 Click here for an explanation of the five-year average benefit formula. You earn an additional year of contributory service for each year in which 500 or more covered hours are restored. Years of contributory service are important because they may help you qualify for increased early retirement benefits—under PEER, for example. Click here for a summary of the types of early retirement and the rules for each. You earn an additional year of service for each year in which 500 or more covered hours are restored. Remember, you may qualify for higher benefit percentages under your Plan’s contribution account formula for your covered work in years after your 20th year of service. Click here for an explanation of years of service. You cannot use restored covered hours to help you vest. Also, the restored covered hours rule only applies to covered hours you lost because of a break in service before 1976. It does not apply to any non-contributory past employment credit that you might have lost because of a break in service. The rule also does not apply to hours you lost because of a forfeiture of service after 1975. If you worked in covered employment before 1976, contact your Administrative Office to find out if you qualify to have any lost covered hours restored. Be sure to check with your Administrative Office whenever you have questions about changes that can mean a loss of covered employment or a reduced work schedule. Find out what you can do to prevent a loss of benefits. Click here for questions and answers about Losing & Protecting Benefits.